The SARARMS K2P Semi Auto Pistol is one of the most comfortable 9mm pistols you will hold and use. With it’s blended surfaces, square surface barrel lock up, ambi- safety, full size grip with a compact slide and low barrel axis to grip ratio: the question that comes to mind is, “Where has this pistol been?” Simply the K2P is the ultimate carry pistol at an affordable price. 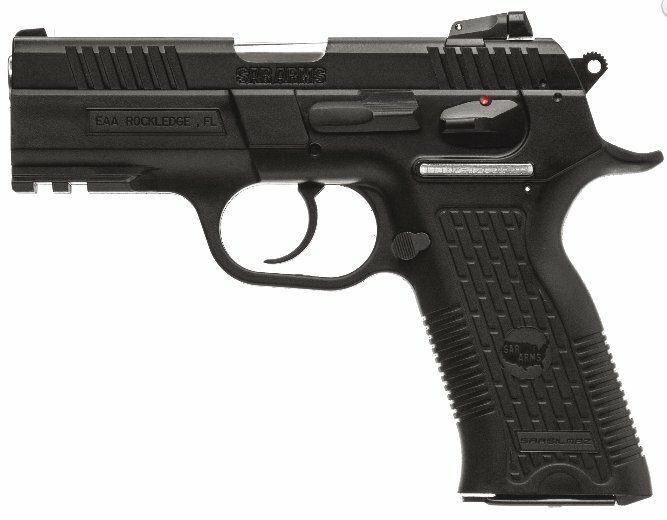 The SARK2P is a clone of the popular CZ-75. Made in Turkey, the Turkish NATO group uses this highly reliable, quality gun. The Turkey NATO group is the second largest NATO group in the world, and if they rely on this gun, you can too! It is a single/double action gun. In single action mode it has a sweet 5.5# trigger pull. If you want to shoot in double action mode, you have a more typical 10.5# trigger pull on first shot, then the SA pull on subsequent shots.